Like many students here at the University of California, Santa Barbara, you’ve probably wondered what all the lights set up in Pardall Tunnel are for. The thought is banished from your head, however, as you swerve to avoid incoming traffic. The lights that line Pardall Tunnel are far more important to UCSB for more than just illumination. They are a way of memorializing a terrible tragedy that shook our campus, and how we would not succumb to the resulting despair. Built by professors Kim Yasuda and Marcos Novak in May 2015, the light passages are a response to the 2014 Isla Vista tragedy. Consisting of both the tunnel connecting the main campus to Isla Vista as well as the trees and grass, lights are bedecked in solar powered LED lights acting as safeguards against the call of the dark. Maddie Berger, the student lead for the organization Blunite, described working with Yasuda as a privilege. Berger’s own group, Blunite, is intent on acting as an extension and application of that. 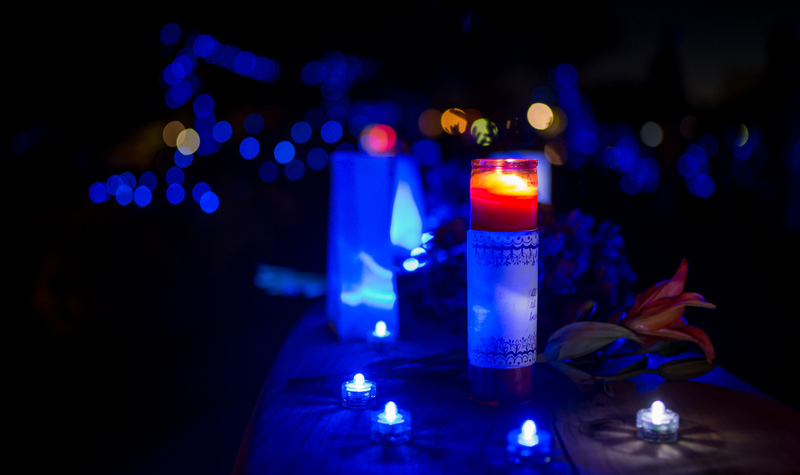 Formed in response to the tragedy of the killings, Blunite is a student group promoting healing and reconciliation by constructing art installations around Isla Vista. The decision to make Blunite focused on art was an easy one for Berger. Their works revolve around their central symbol — the blue light. Blunite, in conjunction with Tuesday’s memorial vigil, continues its mission by distributing LED candles to those present in order to form a lantern to ward off the encroaching darkness. Three years after the incident, the lights still remain dedicated to their fellow Gauchos, and will be a welcome glow as the night descends. A bittersweet truth about this year’s vigil is that among those attending are the last group of students who were there at the time of the tragedy. This year’s graduating class of 2017 may have been just freshmen at the time, but that doesn’t mean they haven’t taken the lessons of the event to heart. Blunite, among the many student groups on campus, is a way for peers to reach out to and connect with each other. Even in the face of tragedy, the campus has proven itself able to not just dwell on the bad in life but to focus on the good.